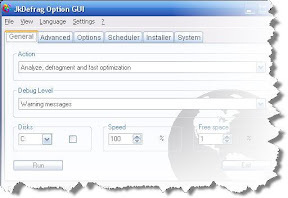 You can schedule defragmentation on various events like on idle time, on startup, once-only, daily, weekly or monthly . At any moment application can be safely stopped without causing any problem to the file system. Even though this is not a rich feature of the application, but it is worth to know that JkDefrag uses Microsoft's standard defragmentation API library and it is extremely safe. Defragmentation is a process that reduces the amount of fragmentation in file system of your computer. Generally files get scattered around a disk in pieces rather than existing in one contiguous because of file movements, deletions and other reasons. Defragmentation process physically reorganizing the contents of the disk to store the pieces of each file together and contiguously. When a file content is arranged contiguously speed of data access and retrieval increases. We have 8 systems in our school library and students work almost the entire day. Most are un aware of the safety measure of computing and download all sorts of files into the system. The fragmentation levels are so high that each system gives different troubles,one hangs another freezes! The HDD must be loaded with rubbish and sick with fragments. I use PerfectDisk. Some highlights for me -- it consolidates free space, defragments system files, and requires as little as 5% free space to defrag. Might be an option. Never used jkDefrag. @Neptune - jkdefrag without the GUI has plenty of options... You just need to specify them from the command line. See the HTML help file that comes with it.